Bicycles were introduced in the 19th century in Europe. The basic shape and configuration of a typical upright or "safety bicycle", has changed little since the first chain-driven model was developed around 1885. 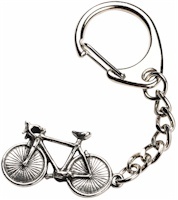 A bicycle made in pewter supplied on quality key chain.